Coffee With D does not have a bad plot but it could do with a better on-screen translation. What lets down the film is the way it is executed and shot. The film’s music and dubbing too are disappointing.If you have got absolutely nothing to do this weekend, you could consider watching this film. Honestly, though, I would prefer watching Sunil Grover on The Kapil Sharma Show instead. Tacky production isn’t exactly a crime if the content is engaging. Sadly that’s not the case here, and you end up pointing out disinterested, sleepwalking actors.A caricatured D and his antics, coupled with bad sound designing, make Coffee With D end nowhere close to a fun film it could have been. It is also to lampoon the TRP hungry TV industry, whose bosses will do anything to get those eyeballs, even if it is most outlandish. If a mobster sitting across a table can give gyaan to whoever cares to listen, why not? And the idea had potential. But when you run out of a plot within a few minutes of your opening, you have no idea of production values, and when the execution is beyond awful, all you want to do is to run. What could have been a hard-hitting interface is drastically diluted with words and sentences beeped out by the censor. This is a satire that is meant to offend none. It steers miraculously clear of vulgarity while negotiating a bumpy ride from Mumbai to Karachi. Coffee With D is like an unfinished unpolished version of what could have been a rollicking run-in into a ruminative session between Indian’s biggest fugitive and loudest journalist. If only it had been allowed more leg-space to lunge in the lap of the ludicrous. Honestly, I went to watch the movie expecting to kill myself by the end of it. But it wasn’t as bad as I expected it to be. 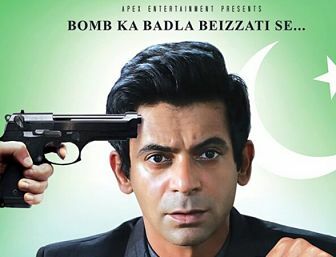 I had high hopes from Sunil Grover and he lived up to it for most part of the film. The second half of the film kept dragging on and the makers tried to make it look patriotic but it lacked the emotions.You can watch it if you are looking to enjoy a light movie. Even if you skip it, you are not missing out on anything. What do we learn about Dawood, thanks to ‘Coffee With D’? That he diverted the Malaysian Airline Flight 370, because he was travelling from KL to Karachi, but the flight itself was headed to Beijing. He just landed the plane in his house, and the missing passengers are now his servants. Eh? This is not even funny. To make a satire on Dawood Ibrahim is a brave effort, no doubt. But is it a successful effort? Barely. For a film that is a satirical take on news channels, it gets its facts askew for comedy’s sake, which is granted. It could have been good film, but the undoing of Coffee With D is its post-production. The film is let down by shoddy editing and a bad dubbing job where entire sentences are muted and out of sync. A story that has potential is ruined by poor execution that distracts you from the plot. Sunil Grover, known to most as the beloved pig-tailed Gutthi from one of TV’s most popular comedy shows, takes himself a bit too seriously here. And this spells doom for the proficient mimic who ends up channeling too many characters to be able to build upon his own. Zakir Hussain makes the world’s most feared don appear distinctly cocky and reduces him to an extra who chuckles at his own chutkulas. The Censor Board has been meticulous in beeping out ‘Bombay’ and a few other names and words which were possibly deemed objectionable. But the only reason why this film should be held from moviegoers is because it is singularly boring and can be harmful to one’s mental health. In this hilarious escapade, India’s leading journalist, Arnab and his team manage to interview the most dreaded Don – D. India’s most loved news reporter is going against the world’s most wanted Don.